It seems like my photography is taking me further back into the past to the first photographic process from the mid. 1800s. 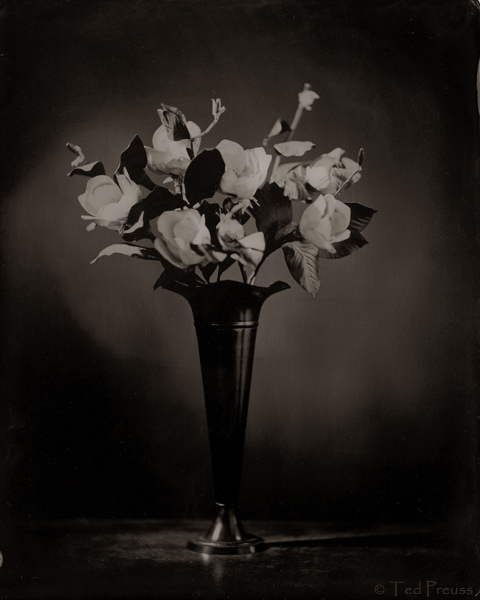 Here’s one of my first collodion plates titled Magnolias. I think my exposure was around 3 minutes! It’s a real fun process but can be dangerous since you’re dealing with ether, potassium cyanide and silver nitrate. A few years ago I took a workshop with Bill Schwab and Joe Smigiel to learn the correct way to handle and mix the chemicals that go into this process…thank you guys! These plates are one-of-a-kind pieces no reproductions will be made. Wow! This is beautiful. I've done both ambrotypes and tin types and know how difficult it is. Your plate is lovely.